My Adventure is starting! I'll write more when I have more details! OK, So I've been investigating things, as you know. Today, on our morning walk we passed by PetSmart and they invited me in. mom said, Tomorrow. Did you hear that! I'm going tomorrow! To Day Camp! I'm a little wiggley excited right about now. I haven't been to Day Camp in FOREVER! Like, almost a MONTH! I think that's what my bag is out for! Wait wait wait. The bag only comes out if I'm going to a sleepover. WOAH! Day Camp sleepover! I'm going to have to think about that. Mom and Dad don't come to Day Camp sleepovers. My Dad is wierd and we have it on film. Mom says pixels. Whatever. Here I am enjoying a simple cuddle with him. Then he goes wierd on me. He calls this a Hand Crab. Sigh. Uhm, Dad? Are you done yet? I love you in all your wierdness Dad. So I put my investigating nose at work today to try and find out what's going on this week. Here's Mom's Suitcase. Uh hunh. Fin things, tripod. She's going somewhere near water to take pictures. We all know -I- won't be near the water. It's wet. Move on to the next suitcase. Daddy's. Uh hunh. Shorts, t-shirts, books and plastic cards with fish on them. What's with the water theme here? Next suitcase! OK, THAT's the gorilla suit. I don't think they want that one getting wet. Next suitcase! Bolo's bag! It's my bag! It's my bag! Ok, calm down, must stay calm. My food isn't in there yet, it means it's not ready to go. Phew! Still time to get excited. I'll keep you updated on what my investigating nose finds! Wow, that picture is 2 years old! I can't do that this year, the snow bank is too deep. Oh well, welcome to my Monday Morning Report. The only thing I have to reports right now is that IT"S COLD. There's a brisk wind coming down and I'd rather be inside. 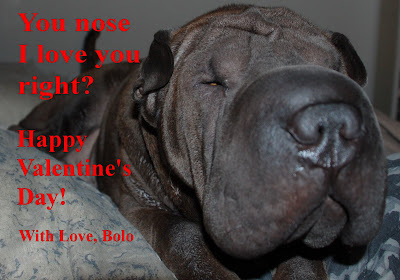 There was some serious Bolo Sandiwch Cuddling last night AND early this morning, after I pushed Daddy off the bed. He was warm, I wasn't. And I've been mooching scratches off of Mom until she got off the computer. I do that by sitting next to her and butting my head into her leg, or her elbow, or whatever is convenient. Mom said I was having big adventures this week. I see no signs of Adventures. Wait a minute, there has been a few signs. 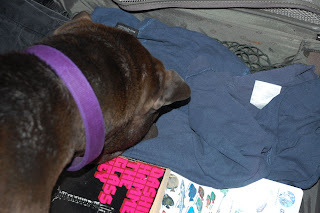 Mommy and Daddy packed a box of stuff and gave it to Uncle Brett to put IN A SUITCASE. 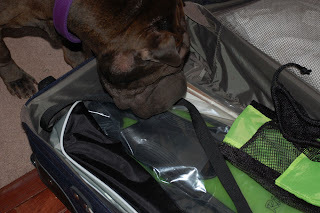 Is a SUITCASE the same as a BAG? 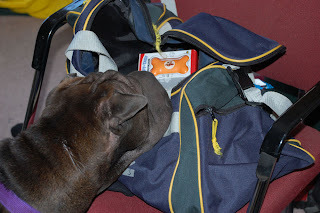 I have a BAG and it comes out when we go on long adventures away from the house. 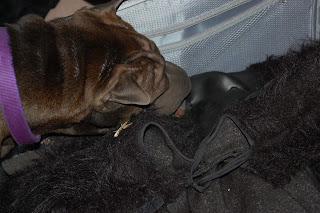 Mom's SUITCASE has stuff in it too. Hmmm. I must INVESTIGATE! Daddy went to see my Grandpaw yesterday and gave him this card I made for him. Grandpaw was touched. Daddy said to show it to the nurses so they could go Awwwww. If you've been following a few Doggies Blogs around here you'll know that Bogart's Dad is still in the hospital and that Bogart got to visit him! That's going to help so much for all of them. 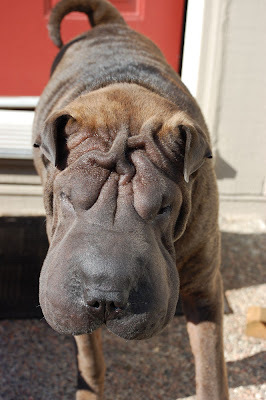 So I'll be sending out more Shar Pei vibes in that direction today. And of course, vibes to my Grandpaw as well. Other than that, it looks like it'll be another busy Sunday. I feel a nap coming on. It's time to vote for the DWB Photo of the Month! You may or may not know that my singing photo was entered by Mango. I'm up against some stiff competition (some of them are friends!) but remember to vote! Mom and Dad and I are also working on a Kard for Klaus (that's Bogart's Dad). Oo, I hope that wasn't a secret. Hmm, no, they wouldn't have posted it in a public forum if it was. Aww, Mom wants the computer back to work on my picture! Wait! Mom, we haven't posted a picture for my fan club! Oh good choice! Mom calls this my Little Tank look. Ok, gotta go! Work to do! I have my worried face on again. I'm still worried about Dannan's Girl and Bogart's Dad. Then when Mommy and Dad came home yesterday they said that MY Grandpaw was in the hospital. He's going to be a bionic Grandpaw because they had to rebuild his leg after he broke it in two places. Well, ok, now I'm worried. If he has bionic legs, I'll never be able to catch up to him when he's walking. 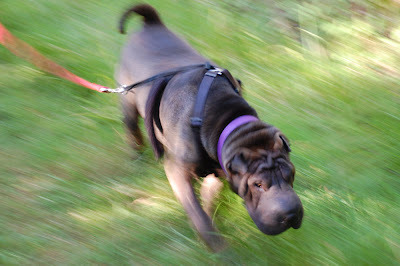 I hope he'll slow down for a non bionic little pei. I hope I don't loose a wrinkle from being so worried. I'll try and not worry, but it's hard to change your mindset sometimes you know. 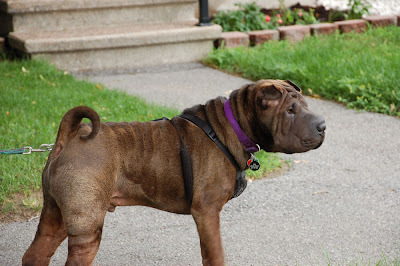 Back to thinking happy Shar Pei thoughts at my friends and Grandpaw. It snowed yesterday. While that's very nice to cover my backyard and everything, I'm a little tired of it. It's much too cold. I want to go outside and lay down in a sunbeam! Sigh. Mom says it's all part of living in Canada to have to put up with snow like this. She also said that I won't have to worry about it next week. Yeah? Why? She won't tell me. For those who haven't heard yet, Bogart's Dad is really sick, so head over there and send them get well vibes please. And think of Bogart and his Mom while you're at it. They must be having a rough time too. My friend Dannan's Girl isn't feeling too good either. So leave some happy thoughts there too please. We have to take care of our friends you know. That's my plan for today, take care of my friends. Mona's and her Mom sent me a really nice powerpoint presentation all about friendship and inner strength. Very appropriate timing Ms. Mona and Ms. Mom. 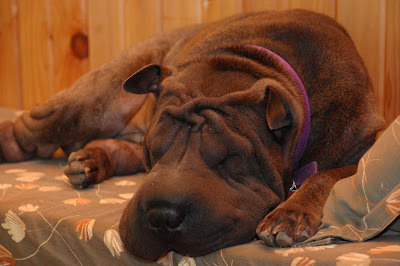 OK, I have to go and send out Shar Pei vibes to my friends in need. Mom and I went through the Bolo Picture Archives to find a sunshine picture. We've had nice sunshine for the last few days, but of course, the camera didn't come out for Bolo pictures. NOOOOOOO. Mom was more interested in napping with me. She has strange priorities. As I said, Mom has been napping with me the last few days. She still has A LOT to learn about napping. We're going to have to practice A LOT. 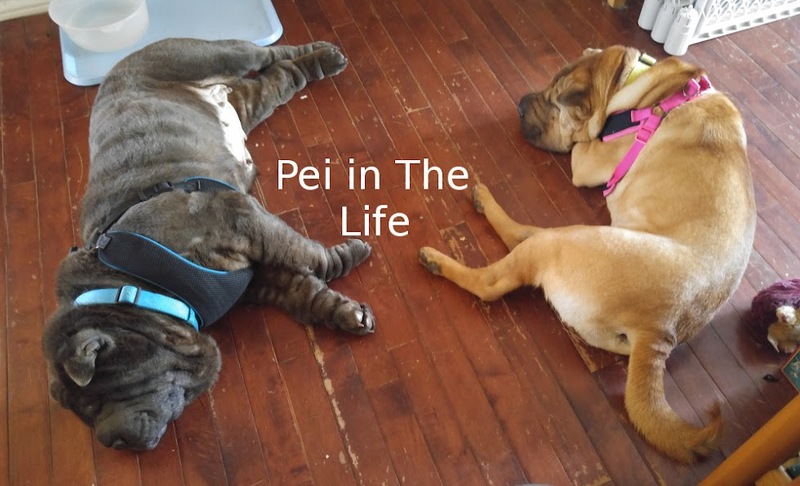 Pei laughter. Daddy had a rough day at work yesterday so Mom and I stopped to see him at lunch. He rubbed my head and my nose and he had a much better afternoon. I didn't get to rescue him from work though. I was waiting for him by the door and made sure to give him nose kisses as soon as he came in! He said that made his whole day brighten. I'll be doing that again this afternoon! As for plans for today, there was some serious Bolo Sandwich Cuddling going on earlier this morning and an Adventure where I got to bark at a few other doggies, but other than that, I think I'll relax and watch the snow come down. This is my thinking face. I had a great weekend with oddles of cuddles and Adventures but now I have to think hard. See, there's this lovely older Chinese lady that is a client where Mom works. I've met her a few times and she loves me lots, I give her kisses. She calls me the little hippo. Mom gives her pictures of me ever now and then because I haven't seen her in a while. Well, yesterday Mom saw her. The lady's name is Su. Su hasn't been in for a long time because her husband just died. Mom was so sad to hear that. Anyway, Su got me this. I got to check it out and even tasted one of the peanut butter ones. So now I need to think of something nice to do for Su. Any ideas? I was in the middle of my letter to Mango with the results for Mango-minster when the doorbell rang. It was my Uncle Brett! I haven't seen him in forever - like a WHOLE WEEK or something. He came over to play on the Wii with Daddy, they were fighting Zombies. Sheesh Uncle Brett, point the remote at the TV, not Daddy. He's only a zombie without coffee. I told Mom that she probably shouldn't be down here, it's a boy thing, she wouldn't understand, so she went upstairs to bed. I stayed with the men. Zombies needed drooling. I'm good at drooling. Oh, I did manage to finish the letter to Mango, but I was cut off, so I want to thank all the contestants, I think I was the hardest working dog in the working group, pei laughter, they were hard to judge. I should have hired Biggie to be my security when I agreed to be a judge for Mango-minster. Mom and Dad went out to get supper and Mom decided to take me to PetSmart just to say Hi to everyone. Well no sooner than we walked in the door than a black giant schnauzerish creater start barking their opinion at me. It wasn't Madison, it was a Madison-impersonator. Then we rounded a corner and a big collie/shepherd something expressed his opinion too. I'd like it noted right now, I'm being as impartial as I can! Two more dogs tried to force a decision out of me before we could leave. I was NOT AMUSED! In other news, Oscar, Tinkerbell and Tucker gifted me with this award. Rules for it here: "When accepting this auspicious award, you must write a post bragging about it, including the name of the misguided soul who thinks you deserve such acclaim, and link back to said person so everyone knows he or she is real. Choose a minimum of 7 blogs that you find brilliant in content or design. Or improvise by including bloggers who have no idea who you are because you don’t have 7 friends. Show the 7 random victims’ names and links and leave a harassing comment informing them that they were prized with “Honest Weblog”. Well, there’s no prize, but they can keep the nifty icon. 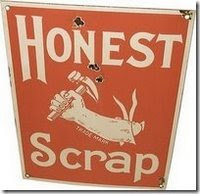 List at least ten honest things about yourself. Then, pass it on! 1-After being attacked twice last year I don't want big dogs near my, unless I know them. 3-I like to curl up behind Daddy's knees when he's sleeping because it's nice and toasty there. Pushing him off the bed is a bonus. 5-I love it when Mommy cuddles me awake in the morning. 7-Even after my pawrents say Fjord! and Adventure! Sometimes I make them chase me around the house to put my harness on. I love that game. 8-Once my harness is on I'll stand by the front door and wait for it to open. 9-I'm not food obessed, that made training me quite interesting Mom said. 10-My most favoritest place to be is up on the big bed surrounded by Mommy and Daddy smells. Unless Mommy and Daddy are around and then I HAVE to be with them. OK, I know a lot of my friends have done this so if you haven't, tag! you're it. And a big Hello to my new friends too! Sally, Samantha, Moose and the TN Bull Terrors. Terrors, Mom would be happy to teach your Mom perogy making. I'll encourage her to make a blog post of it. She says it won't happen until March. So keep your eyes open. So, here's my Adventure Report from yesterday! They were GREAT Adventures, I had more than one. First of all, Mom and I walked over to the Petsmart mall where Daddy was buying Mommy a sub for breakfast. I'm not allowed in the store but Mommy gave Cheryl - who makes the subs and comes to visit me on Hallowe'en - the valentine I made for her. Then we had to drive Daddy to work. We came hom for a bit and I thought that was it so I went for my morning nap. Just as I was settling down Mommy comes in and goes "Are you Ready?" WOAH! Yes! What am I ready for? It was a trip to see a bunch of lovely ladies! My V-E-T Dr. Dunning at Cumberland Vet Hospital and her vet techs! We gave them a valentine too. They went all gushie over it and I got cuddles. Dr. Dunning called me her little valentine and gave me kisses. I tell ya, it's tough to be me. Pei laughter. I also got all my needles so I can go back to Day Camp! I heard Mommy says something about a stay at a spa. Doesn't that mean bath? I'd prefer not thank you. After that it was off to the PetsHotel to say hi to all my girlfirends! And to leave them a valentine and show them my vaccination certificate. I got smooched. Repeatedly. By everyone. Pei laughter. Bet you you're thinking that BOY! That's a lot of Advnetures! Well, I'm not done yet. We went over to Auntie Brenda's! I had some serious snoopervisory duties to attend to. I was in charge of snoopervising the perogie making. First Auntie Brenda tool Mommy ot make the dough. Make sure you do it right Mom, I'm snoopervising. Then you roll the dough out and put it on a perogie maker and add little rolled balls of mashed potates and cheese. Oh, is that a fallen one? Then you put the "lid" on - another thing of dough - and they come out and you boil them, then coat them in butter and put them in a BIG bowl until they've cooled and you can package them. Then, as the snoopervisor, it was MY JOB to say, ok ladies, break time. Everyone grab your squirrels! We left Auntie Brenda's and picked Daddy up from work. I got home EXHAUSTIPEITED! Mom and Dad and I went to bed REALLY early, we were all ehaustipeited, and we gave each other HUGE cuddles. Mom fell asleep with me in her arms. She likes that for some reason. Not that I'm complaining you understand. Pei laughter. Today I have to finish judging the working event for Mango-Minster. It's tough. I was able to narrow it down to three. But who wins first? I don't know yet. Today is my ADVENTURE DAY! Mom promised me ADVENTURES today. Oh I'm so wiggly excited! No pictures right now, I'm saving the spot for when Mom whips out her camera today to capture all my excitement at my ADVENTURE! Is it time to go yet? Fjord? Welcome to my Monday Morning Report! So I went with this picture for the Mango-Minster: Thank you to everyone who helped me decide. I had a great weekend with lots of cuddles and then Daddy had friends over on Saturday night so I got to bark and let them know this was my house, then I accepted ear scratches as a toll for letting them inside. Pei laughter. Sunday Auntie Brenda came to see me! I made sure to give her lots of snuffles and encouragement as Mommy made her try Dance Dance Revolution on the Wii. Then it was off to rescue Daddy! That's always fun. Auntie Brenda said she'd see me Tuesday. But Mom won't tell me what's going on Tuesday. She said it's a surprise. Uhm, alright. I hope it involves chew toys though. What else? Oh yes! I can officially say that I'm a Mango-Minster Judge. I'm judging the Working Group. You can see the nice things Mango had to say about his judges here. I realized as Mom and I were looking through the pictures today and all the Working Group dogs are all bigger than me. No one has tried to bully me or anything, but it does lead me to wonder how often this might happen in that OTHER DOG SHOW. As I said, I'm judging the Working Group and it's going to be tough. Only a few of my friends are in it (Madison, Tinkerbell and Biggie) and I hope they won't be upset if I don't pick them. I think they're more reasonable than that though. I entered in the non-sporting category and I know I have some stiff competition so I'm not worried if I don't place. I see this as a great opportunity to MAKE more friends because I'm checking everyone's blogs. Pei laughter. OK, here's my news. I'm entering the Mango-minster! Check it out here. My buddy Mango (Solidarity in slobbers Mango!) is a genius GENIUS for coming up with this. So I have to enter a picture before the end of the weekend so I need you're help. Which picture should I send? It took two days to narrow it down to these five. 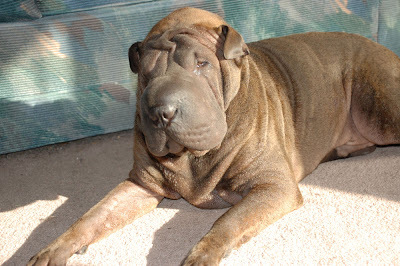 Now remember, Shar Peis are in the Non-Sporting group. That's kind of the reason I picked a few sleeping ones. So feel free to help me choose one. I'm kind of leaning towards picture 1 or 2 but I'd love to hear your opinion. Thank you everyone. And don't forget to enter yourself in the Mango-Minster! Oh my Dog! I totally forgot today was my Gotcha Day! Mom didn't forget, she has it written on the calendar! Mom sang me Happy Gotcha Day and Dad has been cuddling me like this (this was at Christmas, but you get the general cuddling idea). And Mom says there is a Honey Bone in my future. Yummmmm. Honey Bones! Guess I'll have to wait and blog about my other news tomorrow. Who wants to come and party at my house today? Besides going out to take Daddy to work, there isn't much going on today. Mom is getting her lunch together so she must be going to work. Sigh. Wish she was staying home. Oh well, if she's at work that means I can play with the computer. I have to find the best pictures of myself I can find because I want to take part in Mango's Mango-minster. My buddy Mango (Solidarity in slobbers Mango!) did an interesting study of the Westminster dog show. You can see it here. 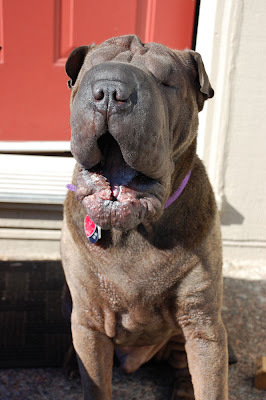 I'm pretty darn sure a Shar Pei has never won. I'll stick with the Mango-minster. In other news, Mom and Dad - well, more Mom - is teasing me because Laney said she'd be my Valentine. She said it in the comments of yesterday's blog. Sheesh! Much as I'd love to meet Ms. Lois Lane herself, the only thing between us right now is distance. Although everyone in my house thinks she's really pretty. OK, I'd better throw Mommy out the door so she can get to work. So I have to make a Valentine for my ladies at the PetsHotel. I was thinking this picture. What's a good caption though? Can anyone help me with this? In other news, Mom got home yesterday and Daddy disappeared. Uh hello! 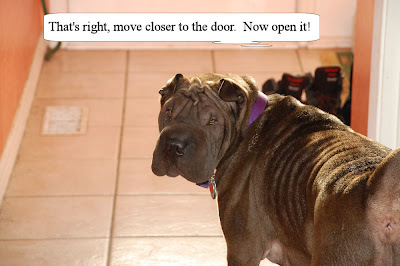 Shar Pei needs cuddles! Mom did give me good cuddles and then when she went to sleep, she let me curl up behind her legs. But she had put the gate up so when Daddy came home I couldn't run down to greet him. It was almost painful for me, you know what I mean? Oh boy it was nice to see Daddy though! I wagged my tail a gave him nose kisses. It's all about the nose kisses. Mom says something special is happening this week. It better not be a bath. Or a nail clipping. Oh wait, now that I've said that, I'll probably get both. Sigh. It's time for another Monday Morning Report! It's been a weekend full of Adventures. Saturday Daddy took me to PetSmart to get Rollover! And to be worshipped. They love me there for some reason. When we came back, Mom was home from work! So I had to tear around like a goof to let her know I missed her. Then on Sunday, Mom took my on an Adventure to rescue Daddy from work! Then we all went to PetSmart, and I got worshipped. Dad bought me food too. It's still a little snowy and icey so even though we live pretty close to PetSmart, we always take the car to buy food. Mom and Dad are pretty smart, even if they do have opposable thumbs. I had to help Mom take pictures again today. She bought a box to take pictures in. So Sunday I snoopervised her takeing a few pictures. Like this one. 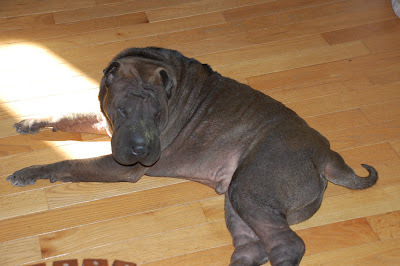 No, it's not a real Shar Pei, it's a sandcast figurine. But he is kind of cute.